Trelleborg is a leading polymer solutions provider, offering tailor-made services designed to seal, damp and protect critical applications in challenging defence industry environments. The company uses high-quality materials and technologies to help customers improve the performance of underwater platforms by developing functionality and increasing output. Trelleborg’s materials increase flexibility through their steady strength-to-weight ratio and lightweight characteristics. The company’s product range includes Eccospheres®, which are hollow glass microspheres, and its syntactic foam series, Eccofloat®. Forming part of Trelleborg’s product collection is its Elastoshield™, which is used to shield cables and hoses from fire, while its flexible piping solution, Elastopipe™, offers resistance against erosion, eruption, impact and jet fires without the need for heat-treatment. The company provides its own dampening, sound-reducing system called Firestop™ that helps clients protect their equipment against the harsh naval environment. Trelleborg develops a variety of products that aim to enhance underwater platform signatures through reducing radiated noise and acoustic size. Products include tiles, sonar supplies, RhoC and damping materials, as well as encapsulation solutions. Intek® is a high-quality, lightweight thermal and acoustic insulation system that has an extensive operating temperature range and is simple to connect. It is used to protect equipment against fire, smoke and toxic chemical emissions. Trelleborg’s range of D series, Super D and DX anti-vibration and shock mountings are typically used in vessels that require high-degree vibration isolation and shock impact protection. The mountings have a variation of stiffness ratios to obtain the maximum vibration isolation result and lowest possible underwater noise levels. Additional buffers can be used to limit the movement of suspended equipment. Trelleborg offers underway replenishment (UNREP) solutions that include adaptable fuelling and refuelling hoses supplied with a wide range of connecters. The company’s Docker™, Magdala™, and Atlantis™ hoses discharge petroleum products in dock or barge facilities, while Trellsub® can be installed for outstanding signature performance on all high-pressure / vacuum fluid lines between hull and platforms. Trelleborg has a wide-ranging portfolio of field-tested coated fabrics designed for the naval industry. The products are made from material that has been tested in more than 100 situations to provide application-specific solutions to suit every requirement. Trelleborg’s port security barriers are inherently flexible, can be easily manoeuvred in water, and are designed for high-impact areas. Trelleborg’s low-pressure (LP) floating pneumatic fenders are designed to spread berthing forces over a large area, while they are easy to deflate and store. The Trelleborg Dracone barge is an essential component in the ship-to-shore transfer of bulk liquids. These units provide a unique and easily accessible system of liquid storage and transfer. With more than 40 global ISO-certified manufacturing facilities, Trelleborg can support projects with proven material and application expertise developed for demanding defence industry requirements. 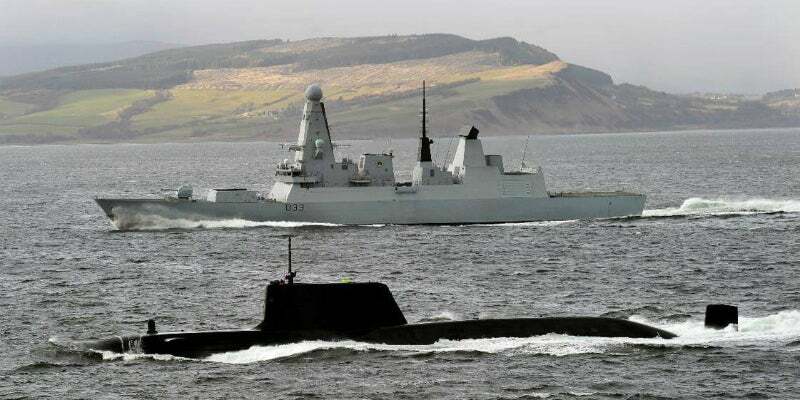 The company’s solutions provide a competitive advantage to its customers by guaranteeing a long-term business partnership that helps optimise naval performance. For more information on any of the above, please use the form below to send Trelleborg your business enquiry. Trelleborg’s applied technologies operation will showcase its range of buoyancy materials at Oceans 2018 in Charleston, South Carolina, from 22-25 October. It will give attendees a first-hand look at some of the company’s advanced composite materials, including Eccofloat®, a high-strength syntactic foam, and Eccosphere®, hollow glass microspheres. Trelleborg understands your need to protect your assets. Our engineered polymer solutions can be found in the deepest oceans to the furthest reaches of outer space. Trelleborg's naval fuelling and refuelling hoses have a full range of coupling and diameters, enabling all couplings to be fitted either by crimping or with half shell clamps. Trelleborg's broad range of anti-vibration mounts are produced using carefully selected resources and expert knowledge in polymer engineering. Trelleborg's Eccospheres®, high-performance, hollow glass microspheres, and Eccofloat® TG syntactic foam series, have a consistent strength-to-weight ratio to maximise buoyancy and reduce weight when in the air. For over a century, Trelleborg has been developing innovative and custom-engineered coated fabrics for defence and government applications. Trelleborg has a large portfolio of products that help to improve the signature of underwater platforms through the reduction of radiated noise and target strength. Trelleborg introduces its polymer solutions in its company video. As a world leader in engineered polymer solutions, Trelleborg is able to seal, damp and protect critical applications in demanding environments. Trelleborg has launched an app, providing long-term traceability through automatic identification of Eccofloat® parts or vehicles throughout their product lifetimes. Trelleborg’s offshore operation has introduced its next-generation Firestop™ material, which is a newly established fire-resistant material.